In general, a plasma results from the breakdown of gases into reactive atoms and molecules. Changes in the atomic states, energy changes, result in the emission of light. The resulting wavelength is uniquely characteristic of that energy change. 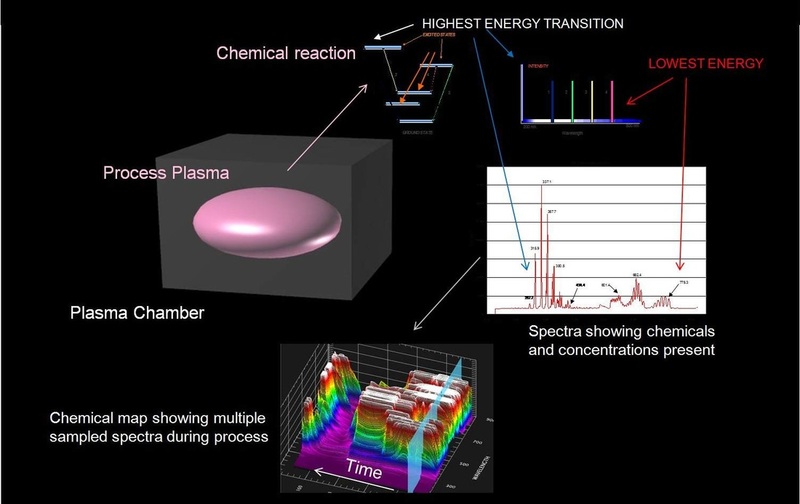 There are a variety of ways to monitor optical emissions from a plasma, but the ccd based spectrometer is the most utilitarian. in most common applications. Lightwind has preconfigured two systems for non automated applications. For industrial applications where plasma emissions are used 24 x 7 to monitor/control/fault detect processes Lightwind has several solutions. If the application requires a more demanding solution there are many additional choices we can offer including configured application specific spectrometers, high resolution scanning monochromators, or even PMT centric choices for individual wavelengths. Contact us if you have questions. We have configured spectrometer kits which will cover most plasma applications. The kit includes preconfigured spectrometer, fiber optic cable and software. These spectroscopy systems are designed for continuous monitoring, endpoint and control of plasma processes. They include LIghtwind process and endpoint control software and can be interfaced to manufacturing systems. This reference is a large downloadable plasma spectroscopy look up table which includes both species by wavelength and and wavelength by species table. This is a free download.